Last week I posted a deal to get an 8GB RAM upgrade kit, the price was too good to resist and I went ahead and bought the upgrade myself. Here’s my review and impressions on upgrading a Mac to 8GB of RAM. If you have ADHD and don’t want to read everything below, here’s the Readers Digest version: buy an 8GB upgrade, it rocks. The RAM I got was the Kingston Apple 8GB Upgrade Kit , it works on most new Macs, all the new MacBook Pro’s, Mac Mini, iMac, and MacBook. I imagine all those machines would see the same performance increase as I did. Anyway, I put the 8GB upgrade in my base model unibody 2010 MacBook Pro 13″ with a 2.4 GHz Core 2 Duo CPU, which otherwise comes standard with 4GB of RAM. Installation is so easy it’s barely worth mentioning, upgrading RAM in the MacBook Pro is a matter of undoing a few screws on the bottom of the Mac, lifting off the aluminum case, removing the old RAM, and popping in the new memory. From start to finish it takes maybe 10 minutes at most. Is the MacBook Pro faster with 8GB RAM? As you can see, there are no “Page outs” (the movement of data from RAM to hard disk). I have a ton of apps open right now and I’m not even close to hitting virtual memory (you can read more about virtual memory in Mac OS X here). Anytime you can avoid using virtual memory your Mac will perform faster since it does not need to access memory contents from the slow spinning hard drive, remember the default HD speed in a MacBook Pro is a rather slow 5400 RPM, the speed of RAM blows this away. 4GB of RAM is a good amount but 8GB is better. On a daily basis I frequently have the following apps open all at once: Photoshop, iTunes, Preview, Terminal, Transmit, Transmission, Text Wrangler, iChat, and here’s the real RAM hog: Safari, Chrome, Firefox, when you have three web browsers open at once with a ton of tabs open, your system will often slow to a crawl (web developers in particular can relate here). If you throw in a virtual machine, you’ve long hit the point of painful slowdowns. The reason for the slowdown I mentioned earlier, when Mac OS X is forced to start swapping data from physical memory to the 5400 RPM hard drive you feel the drag. With 8GB I am doing the same work now that I was earlier today, but earlier today I was using 1.5GB of swap and now there is none being used, the difference is remarkable – no more beach balls and halts. The MacBook Pro simply performs better with 8GB of RAM. Is upgrading the MacBook Pro to 8GB of RAM worth it? Yes, particularly if you’re a power user. The price of an 8GB upgrade is cheap enough now that the gain in system performance is worth it. If you use a ton of applications at once, you will notice the difference. If you find yourself grinding around in virtual memory on a semi-regular basis, you will be thrilled with the speed increase. The average computer user probably doesn’t need 8GB of RAM, but any power user or tech worker will greatly enjoy the additional memory. Reading a few system indicators, you can find out if your Mac needs a RAM upgrade if you aren’t sure that it would benefit you. I think the only problem with upgrading to 8GB of RAM is that now I want to relieve the other performance bottle-neck, the stock 5400 RPM hard disk. I think if you really want to squeeze the most performance, maxing out the RAM and then upgrading the MacBook Pro hard drive is probably the ultimate combination. I definitely have my eye on the Seagate Momentus XT 500 SSD Hybrid Drive now, which combines a 7200 RPM standard disk with a smaller SSD drive for active files and caching, apparently the performance is absolutely blazing for the price (about $130). You can save a lot of money by not buying RAM directly from Apple, so go with a third party vendor instead. Yes that means you’ll have to install it yourself, but if you can use a screw driver, you can install RAM. Other than the occasional great deals on Buy.com, I’d buy RAM from Amazon since it’s so easy to compare different brands and their prices seem to be the most competitive on a consistent basis. Just be sure you get the right module for your Mac. I think the bottom line is this; Mac OS X likes to use RAM, the more you give it, the better it performs under stress. 8GB of RAM is probably one of the most cost effective upgrades for a MacBook Pro that you can get. Pah, on the UK amazon that kit is £176! Outrageous difference, if anything it should be cheaper! Greg, that link is showing me £111.16, maybe it’s showing a different price to those in the USA? 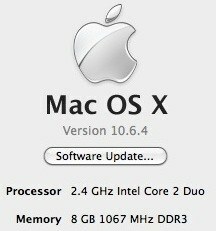 Per an earlier post I decided to upgrade my hard drive to the Momentus XT 500GB (MBP late 2010, 2.53GHz, 4GB, OS 10.6.5). It’s really excellent at speeding up the boot time and programs you use regularly (The adaptive memory monitors what you use and moves it to the read-only NAND chip – so you wouldn’t notice much of a difference over a 7200 HDD for large write tasks). Hmm, now you have me wanting to upgrade the memory too. Ditto, I have the Momentus XT and it flies. Going to get 8GB RAM now to finish it off. Good to hear about the Momentus XT, it’s definitely next on my upgrade list. Upgraded the memory a couple weeks ago (Had to wait a month for it to make its way from the US to Israel). Definitively smoother operation and the OS regularly uses 6-7 GB even without heavy use. Well worth the price. Funny, we have the exact same config and I did also buy the RAM upgrade after you posted the deal last week. I don’t use the MPB as intensively as you do but it was just too good to pass up! ;) Thanks again! I agree, $119 is just too good a deal to pass up! You have an option of customizing ur mac book pro so if you add the 8GB RAM its a 100$ increase which i belive is cheaper then your alternative, just throwing that out there but tanks for the great advice! Last week I upgraded both, to 8 GB of RAM and the Momentus XT 500 GB HHD (from 4GB RAM and stock 320GB 5400 rpm) on my 17″ MBP (my primary workhorse) and I can tell you IT ROCKS! For about $300 total it is like night and day in performance difference and this machine has a whole new lease on life. Highly recommend that if you get one, go for the other while you have the cover off. BTW, I used SuperDuper to do the HDD cloning overnight and in the morning did the switch with no problems at all. Would this work on a late 2008 15inch unibody? I purchased the Kingston 8GB for my MBP thanks to this article. I love it! Paid $119 or so and it makes a WORLD OF A DIFFERENCE. SOOOO worth it. Also upgraded my wife’s MB from 2 > 4 GB. Worth it! I too couldn’t resist the deal and upgraded to 8GB. It’s wonderful. I regularly run a statistical application called Stata on Windows 7 through Parallels 6. I thought my 2.4Ghz i5 handled it nicely before but wow…what an improvement! My MBP handles W7 better than any PC I’ve come across! Thanks! Coincidentally, I had JUST upgraded to 8GB on my MBP. I bought from a reputable eBay store for the same price… $120. I run Windows 7 on Parallels (against my will for college courses, of course) on dual monitors. It has been a NIGHT AND DAY difference. Best purchase I’ve made since owning my MBP!! Note to those of you planning to upgrade yourself. It’s VERY easy but you’ll need a #00 Philips screwdriver which isn’t always easy to find locally. They do have them on Amazon fairly cheap. I grabbed the buy.com deal from last week too and can confirm the difference in performance is huge, I am very pleased. Photoshop is substantially quicker especially with multiple large RAW files open. I have a 17″ IMAC, and it says I can only have up to 4g of Ram. Are you saying that I can upgrade to 8gig and it will work?? I always have this question: what do you do with the 4GB stock RAM. Apple is smart enough to give you 2x2GB. That leaves you to throw away those 2 sticks once you get the 2x4GB. I just purchased the new MacBook Pro 15″ with an i7 processor. Before even turning it on, I put the seagate hybrid drive in with an 8GB upgrade from Crucial. The machine is blazing fast. I do lots of photo editing (Photoshop) and HD movie editing (iMovie and Final Cut). Outstanding performance. Highly recommended. Of course… I equate this upgrade to my Macbook as moving from Business Class to First Class. The drastic move from Coach to Business Class was when I left MS Windows behind!! Can we ask Apple to give us 1x4GB of RAM? Doug, you can ask apple to give you 1X4GB RAM but unless you wanted to pay the difference the answer would be ‘no’ (as it would cost them more). I’m sure if you wanted to pay the difference they could arrange it but apple charges silly money for RAM (i.e. $560 to upgrade to 8GB RAM). 1. Macbook Pro late 2008: can you use 8GB? I have heard different answer regarding this. 1. The easiest way to determine this is to find the serial number of your machine. To do so, go to the ‘Apple menu’ and select ‘About this mac’, Select ‘More Info’ and your serial number should be in the list of the ‘Hardware Overview’ section. Once you have the serial number, go to http://support.apple.com/specs/ and input the serial there. review your machine specs (you may need to scroll down the page to see the max memory supported. 2. I have upgraded to a Momentus XT 500GB with SSD Hybrid and I see no vibration issue. The upgrade has been very worthwhile. You just need to reboot your machine a couple of times after the upgrade for the H/W to ‘learn’. any idea why only 7.75 GB shows up. where is the missing .25 GB. i just upgraded to 8 GB and it shows only 7.75. I have a 256 MB VRAM card. thanks. my friend has the latest mac book pro and it shows full 8 GB . i think the difference could be because i have an NVdia 9400 while he has an Intel based one. Can you or anyone tell me if this is the reason or share more details why some mac show 7.75 while other show 8.
so if i buy this 500GB hard drive, is there a way to get all the data off the original drive the comes with the Macbook pro and put it on this one. I just bought a macbook pro 17” i7 2.8. I m interested in upgrading the memory but i m concered about warranty & applecare….will the warranty be voided if i replace the memory myself? Thank you in advance for your help! yes. Warranty will be voided. i have the 2.8ghz 17″ macbook pro…..after reading alot of reviews and blogs i went for the corsair 8gb ram kit which i found for £66 and also bought the seagate 500gb momentus xt hybrid harddrive. installing the ram was easy, and so far so good its working perfectly. the harddrive was a little more tricky….it cam with the older firmware and there had since been two more revisions by seagate. i downloaded the latest from seagate ( as i have a mac i had do download the .iso and burn a bootable cd, although i ran out of cd’s and used a dvd instead.) I replaced the ram and the harddrive at the same time ( i had allready used a free copy of carbon copy cloner to duplicate my original drive whilst it was still in the macbook pro). once both were installed i turned it on to check it all worked, then had to put in the bootable dvd and restart holding down ‘option/alt’ button. this let me choose the ‘windows’ boot icon that came up and then it ran some dos looking stuff, i had to then click ‘escape’ and it gave me the option to press key ‘d’ and it installed the firmware upgrade. then i had to restart the computer choose the mac hardrive option that then came up and it all started up properly. from then on it starts up without going back in to the boot options menu. all so far is running well, programs do seem to spring into life alot quicker. the harddrive does seem to permantly spin, the old standard one was able to power down automaticly when not in use but this doesnt….doesnt bother me personaly but its worth thinking about as i guess it will use up more battery power. although its only been a couple of days so far i am happy with it! ps…apparently you can replace the harddrive and ram without voiding the warrantee, there were no warrantee removal stickers in the way of anything when i opened up my mac. That 120$ ram is now available for 49$! I have a 2.66ghz i7 MBP 15″. It’s currently running with the standard 4gb of Ram. With a newish processor and dedicated graphics do you think i’ll see a big jump in performance if I upgrade? Yes if you use a lot of apps at once you will see a difference. If you want everything to feel faster in general though, upgrade the hard drive to an SSD. I was moments away from pulling the trigger on Apple’s $400+ 8GB upgrade when I stumbled across this article. I’ve just ordered the Kingston RAM from Amazon for $49. That’s an order-of-magnitude price difference! Thanks!! I love this author’s writing style, he’s a hoot. I also did some upgrading to my MBP 7,1, – an Intel 160 gb ssd and 2X4 (8) GB of Ram – BUT my machine will not boot up with the RAM… if I remove the new ram and reinstall the original 4 gigs it boots up fine…. Any ideas? Everywhere I check it says its the right RAM…. even says MAC on the pkg…. RAM could be bad, run a RAM test if you can get it to boot. Make sure it’s seated in there properly too.